NBR is an excellent all around material for general industry. High overall value due to its top performance in many categories. Our proprietary blend which features the latest name brand ingredients have greatly increased the performance of this proven material. CR, NEO, NE, N50 is an excellent hard wearing all around material for general industry with a nice rubber feel and memory. Anverflex PUR is a new proprietary blend which is tough, and long wearing. It is non-marking and is long lasting as pressure and heat is used to cure – vulcanize the material in the molding process. Suitable for many applications where heat is not a factor. Shiny gloss finish. SIT is excellent for high heat or food packaging. Soft and pliable, meets FDA Title 21 and German spec. BGVV (BGA) Part XV for contaminant-free load handling. Contains no dyes that can leach out when handling baked goods, drugs, glassware, hot products from molds, etc. Our new formulation minimizes almost completely the yellowing with age which use to occur with clear silicone in the past. SI is excellent for high heat applications such as mold part removal or where heat resistance is required for large cups/seals. Silicone is also a good choice for cold outside applications as it stays fairly soft to lower temperatures than Nitrile or Neoprene. S45 is excellent for EOAT high heat applications such as mold part removal from plastic injection machines requiring a soft touch. Higher durometer for bellows cups. MD is a unique Silicone formulation made specifically for high heat applications in the baking food industry. This special rubber blend is designed for use with metal detection equipment used to safeguard food from metal objects as it is conveyed down the line. MDB is a unique Silicone formulation made specifically for high heat applications in the baking food industry. This special rubber blend is designed for use with metal detection equipment used to safeguard food from metal objects as it is conveyed down the line. NR is widely used and specialized for the printing, paper, and wood industries. It is low cost, non-marking, wears well and has a natural negative charge which allows it not gum up with ink or cut paper dust. While great for picking paper sheets up this is basically the same material used in rubber bands and is not suitable for general use. This material does not respond well to UV light, ozone, chemicals, oils, water etc. Electro-Static Dissipative Nomastat® ESD is a specialized proprietary rubber that can handle heat and is static dissipative for any industry where static buildup is a problem or explosion proof requirements exist. Applications are typically in the electronics, high tech, automation, packaging and printing industries. It actually bleeds any static build-up out through a ground of the machine or other ground designed into the system. Neutralized additives are blended in a special elastomer blend to diffuse static buildup. This elastomer blend has a insulating static-dissipating value of 97K *CM @ 500 Volts. TPU is an extremely tough material which darkens with UV exposure. It is sold under various proprietary trade names and the main market is hard caster wheels. We use TPU in static press applications such as bottle gripper bladders but rarely on cups anymore. We found it long wearing in static applications but usually too expensive to justify its use in vacuum cups which flex a great deal. To compensate for the material’s hardness, cups using this material must be designed with thinner walls which break down faster. While initially promising a few years ago, TPU’s expense, hardness, lack of memory have proven to far outweigh its increased wear performance over other recently improved materials. FPM is specialized for high heat jobs. It is best for static compression applications and has a stiff, somewhat dead feel for vacuum cups. It is also relatively expensive which limits its vacuum cup use. The newer High Heat Silicones have replaced Viton for most applications. VYL is soft, low cost, and readily available in many grades for general light-duty or household use. Poured vinyl’s or the clear vinyl used for push-on type suction cups are not suitable for industrial use. Vinyl will work for push on cups but they break down if repeatedly used for vacuum cups used in automation as they do not have good memory, tensile strength or mechanical properties.. Vinyl also handles heat poorly. The injection molded blended vinyl ANVER uses in its industrial vacuum cups is better, but you loose a key advantage of low cost to other materials. NM is a new ANVER proprietary material which is non marking yet high wearing even in hot conditions. It is a silicone-free hybrid blend which is non marking and will not leave any residue, mold release agent or ghost-mark on products which need to be painted after handling. This material also handles high temperature and is extremely long wearing making it ideal for the plastic injection mold tooling (EOAT) industry. While not inexpensive this material is priced similar to other top quality urethanes but it offers higher overall value due to its excellent performance. In many applications where heat and non-marking are issues, NOMATHANE® is the best blend available on the market. A custom formulation of the above NOMATHANE® – NM50 contains 50 Duro NOMATHANE® and NM60 contains 60 Duro NOMATHANE®. Both materials are an excellent choice when handling slick, slightly oiled panels found in hot press operations. AR is an ANVER proprietary foam material which is durable yet soft. Featuring a wide selection of profile types and materials, ANDURASOFT® is designed to handle moderately rough materials such as sawn stone, textured plastic, fiberglass mat and saw cut wood surfaces. Our success as a leader and innovator in Vacuum Technology is due to the many important advances that we have made and continue to make in the selection of the elastomers used in our Vacuum Cups. Our cup quality is world class. What is an Elastomer Vacuum Cup? An elastomer is any type of polymer that has rubber-like properties of which there are dozens of material names. 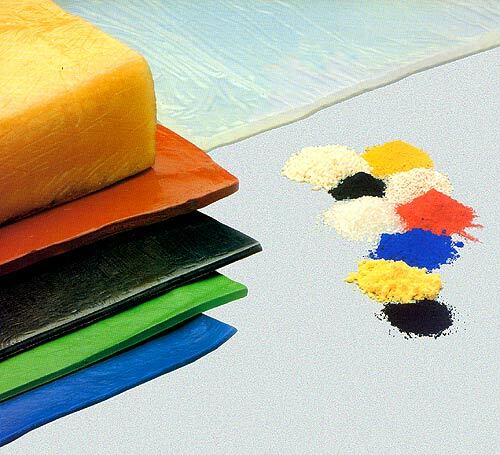 An elastomeric compound, consisting of a blend of a base polymer and other ingredients, is a material that has been designed to meet specific functional requirements. The thing to keep in mind is that while a material may be excellent in another application or industry that does not mean it makes a good vacuum cup. A vacuum cup needs to flex yet have good elasticity, memory, wear resistance, heat and tear resistance, etc. Every cup type requires the right blend of ingredients to achieve this. Polymers – the basic gum-like component of a compound, provide certain chemical and mechanical properties in the final product. Vulcanization agents – to cross-link the polymers. Accelerators – to modify the rate of vulcanization. Activators – to initiate the vulcanization. Plasticizers – to soften or improve processing. Processing aids – to ease handling during mixing, extrusion, calendaring, or molding; and various mold release agents, sprays etc. Age-resistors – to reduce or retard aging. Keep in mind that all rubber products have a defined working shelf life. Miscellaneous ingredients such as blowing agents, pigments, retarders and odorants, all have specific purposes but are not necessarily required. Mold Release Agents – Sprayed into the molds as needed. These can be are source of contamination so application and type used is critical. At ANVER, we take measures to control quality throughout every phase of the development process. By specifying the highest quality ingredients, auditing incoming raw materials, establishing good relationships with our suppliers, and insisting on quality and uniformity in the goods we purchase, we can ensure the consistency of our elastomeric Vacuum Cups, from initial development to final production. You will find that all of our vacuum cups offer high quality and top value in every market segment. Various cup designs have different Durometers. Also note that a variance of +/- 5 in Shore Hardness or Durometer is the industry standard for all rubber products. The maximum temperature given is always for a momentary pick and place lift and not for a constant attach situation. If a cup is held on a hot load for a longer period of time its temperature ability is reduced and it will deteriorate faster. Some materials such as Urethane or Vinyl have more general names which is like saying Rubber or Plastic. Within that name there are dozens of types and grades and it is difficult to make comparisons. For example, Vinyl is used for children’s toys, wall hanging cups, soap dish mounts, but also high end products. It is often difficult to determine the quality you are receiving. We have found that only injection molded, pressurized and vulcanized vinyl is suitable for industrial-duty vacuum cups. We mold with many other specialty materials, including Ethylene Propylene Diene Methylene (EPDM). Contact the factory for details. For a general chemical resistance guide,see DuPont Chemical Resistance.